Technical Car Experts Answers everything you need: Husqvarna Riding Lawn Mower yth2448 mower wiring diagram? 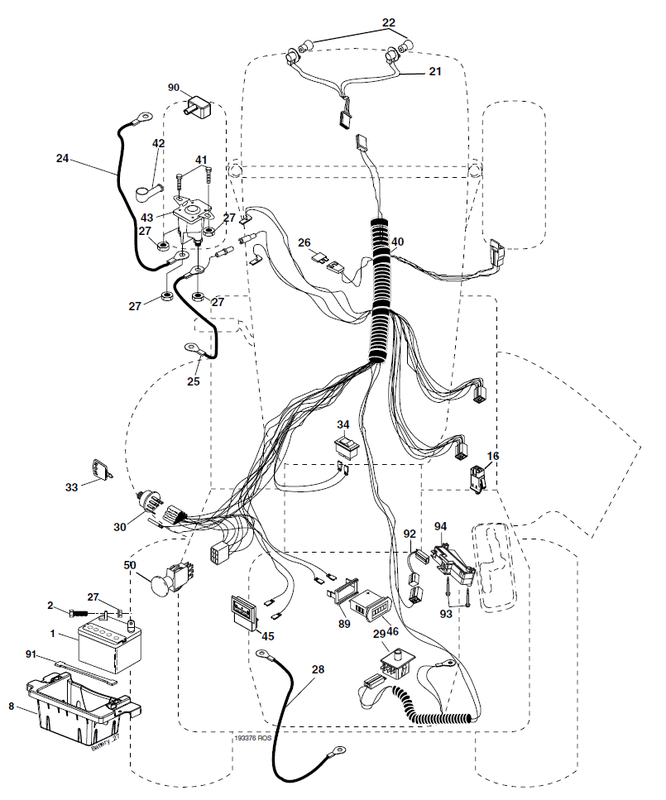 Husqvarna Riding Lawn Mower yth2448 mower wiring diagram? Starting from the positive post of the battery, the large red cable runs to the top post of the solenoid. From there a smaller red wire continues on through the fuse and ammeter (if equipped) to the ignition key switch terminal marked "B" (battery). When the key switch is in the start position, the B terminal and the "S" (starter) terminal are connected internally so you should get 12VDC on the "S" terminal when the key is in the start position. Voltage travels from there to the PTO switch which must be disengaged (off) for voltage to pass through it. The wire continues from the PTO switch to the Clutch/Brake switch which must on (pedal depressed) for the voltage to continue to the small terminals at the base of the solenoid. When voltage is applied to the base of the solenoid, the starter motor will turn. To troubleshoot this, please work your way backwards, starting at the small energizing terminals at the base of the solenoid, then to the clutch switch, then to the PTO switch, then to the ignition switch. Put the black probe of your meter to a good ground on the frame, and look for voltage with the red probe of your meter. Remember the key switch must be in the start position while checking, so you may need an extra hand while doing this. If you do this you'll quickly find where the defective item is. A quick aside, what sometimes makes these a bit more confusing is that each safety switch has four wires - two are for the cranking circuit (turning the starter), and two are for the grounding circuit (allowing or preventing the spark plug to fire). While they work together, for our purposes they are completely independent of one another, so you can ignore half the wires for now and concentrate just on the cranking circuit. 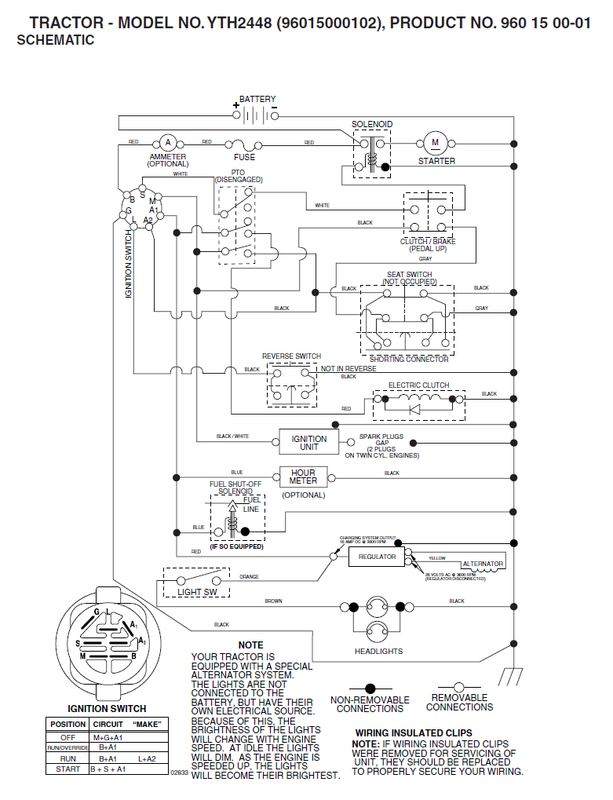 Here's the path: battery > fuse > key switch > pto safety switch > clutch safety switch > solenoid. If you need to start it to mow right away and want to postpone the repair, you can always just jump the top solenoid posts or run a jumper cable (like you use for a car) from the positive battery post to the terminal on the starter the red cable is hooked to. You only need to use one wire of the jumper cable, and touch it carefully until the unit starts, then remove the jumper cable. In affect you are becoming the switch by doing that. Remember someone needs to be in the seat, or the seat switch pressed, in order to start. Labels: Husqvarna Riding Lawn Mower yth2448 mower wiring diagram.